The World of Weeds ... More Tools, Tips and Patio Furnishings at Ergonica Superstore ... and all your Favorite Weeders! ... New Agricultural Solutions ... Organic Farming made easy with the Turbo Weed Twister! ... New Products - Free Downloads Ergonica Home and Garden Shopping Catalog! ... Download FREE Weed Identification Guides! ... Invasive Weeds List with Images Links! ... What Types of Weeding Tools do you need? Where do YOU go for Weed Control? Ergonica - World of Weeds! In our home gardens, weeds demand a great portion of our time and effort to cultivate a beautiful garden. In the economy of agriculture, controlling weeds is a serious, mission-critical, operation. For agriculture applications, please see the White Paper On the Weed Twister and Other Alternatives to Precise Hand Weeding in Agricultural Applications. We are surrounded by weeds. Ever since humans began planting and cultivating plants, weeds have been a problem. A weed is any plant in the wrong place. 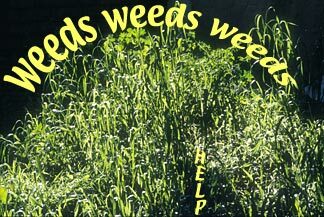 Weeds take valuable space, water, sunlight and nutrients that may otherwise be accessible to important crops. This degrades the quality of agricultural products, increases costs, and may result in poor nutrition for the intended consumer. Consequently, many agricultural solutions include efficient, but potentially toxic chemicals. Here you may discover that some of the weeds you find in your garden may be harmful to the environment or noxious to your regional ecology. Although some invasive weeds compromise the biodiversity of our regional ecosystems, we also have to recognize that agriculture often destroys the native flora, as well. Can humans have their cake and eat it, too? By learning more about our natural environment, we can better protect the world our children will inherit. Will they inherit a world of beautiful flowers and bountiful farms, or will we leave them with a "world of weeds?" Will the chemicals we use in our own gardens pollute the water tables we all share? How can we protect our small animals from herbicides? Browse through the gardening books section to window shop or purchase reference books on gardening, weeds, landscaping and related topics. Ergonica has selected special titles in association with Amazon.com that we believe will appeal to our World of Weeds visitors. The Weeder Features page provides a consumer guide and information as well as a Weeder Features Chart to help you classify numerous non-toxic weed removal tools on the web market today. This information will help you make the right choices in your online shopping for gardening tools and especially weed removal tools and products. But to some home gardeners, a weed is a potential benefit to your garden, as described in the "Weeds and Words" article. A beautiful fragrance to one person, is a cause of hay fever to another. Take a deep breath, open your eyes, clear your senses, and join us for a walk in the natural world of weeds. Pour yourself a cup of tea, and visit for a while. If weeds have survived the disfavor of humans for millions of years, perhaps we may learn something from them? If this is not a good time for you, bookmark this site and come back when it's more convenient for your visit. According to the Bureau of Land Management, some plants are potentially noxious to the environment and should never be transported to other areas. The President of the United States has issued an Executive Order about Invasive Species. It's fascinating to see all the tools and strategies people have created over the years to control weeds, remove weeds, poison weeds, burn weeds, and so on. Here you will find perhaps the largest selection of mechanical weed removing hand tools described on the web. Ergonica has also invented a new tool called the WEED TWISTER that does an excellent job of pulling out individual weeds in tight spaces. Whether you're killing weeds or "grooming misplaced plants," the tool you select could help you get the job done more successfully and efficiently. As suggested in Groom Your Garden, your attitude and philosophy could make the difference between an arduous task or an artful experience. Join us for an educational tour of The World of Weeds by exploring the links and information on this site. These include scientific studies of where weeds come from, agricultural and horticultural methods to control weeds, weeding tips and sites that list and categorize plants and weeds of all types. Also presented are beautiful gardens and arboretums, gardening and nature support groups, and sources where you can purchase tools to control weeds, including this site. If you're in search of an organic, mechanical, non-toxic, or back-saving remedy for weeds, you've come to the right place! Need a Science Project Topic? Students and teachers may also appreciate the science project suggestions and links and the Herb Keeper poem with numerous links in the poem's text. The Groom Your Garden page introduces gardening poetry and words to put you in the right mood for handling the chores of gardening. Many of the poem's links are especially designed to introduce science to children at early grade levels. Unlike many other weed pullers and poppers that require pushing a lever with your foot, for example, the Ergonica Weed Twister can be used to remove weeds by their roots (as deep as 12 inches or more) located a considerable distance from your path. Great for pulling weeds under brush or close to thorny cactus plants and brambles, as well as poison ivy and other toxic plants, in addition to lawn weeds underfoot like Dandelions. No foot levers or hinged tines that often break loose with repeated use! Use the Drill-Ready TurboTorx models to efficiently attack patches of unwanted Bermuda Grass, Crabgrass and other grassy weeds or vines with prostrate stems. Do you have weeds in places that are hard to reach? Are you uncomfortable when stooping down to remove weeds? Ergonica offers several models with different lengths (from 36 to 60 inches) and handle options, including popular drill-ready models, to solve your various weeding problems efficiently and safely. Refer to the Recommended Ergonica Weed Twister Tools Chart at left for practical and ergonomic considerations and use the Price Range Selection Tool below for economic values... making it easier for you to decide on the best values for one or more tools that really work for YOU (YOUR TEAM) AND YOUR WEEDS in various locations and circumstances! Select the best tools by length and handle options to custom fit your needs and your weeds! Shopping Tip: Use the Shipping Estimator in your shopping cart to see how much you can save by various shipping options (FedEx, UPS, USPS) and multiple items to your State and ZIP code. Once you add an item into your shopping cart you can enter a shipping state / country and ZIP code to see all the shipping options and costs. What you see is what you pay once you complete your order and confirm. We also ship to many international countries / states overseas as you will see in the Shipping Estimator. These shipping costs are based on shipping from Southern California USA to your location. The closer you are to Southern California, the lower your shipping costs will be. BTW all Ergonica products are made and assembled in Southern California, USA. See the Garden Tools page for a comprehensive listing of Weed Solutions including Mechanical Weeders, Weed Twisters, Weed Pullers, Weed Poppers, Weed Flamers, Weed Removal Hand Tools, Weed Hounds, Weed Claws, Garden Weasels, Weed Hoes, Weed Whips, Weed Hooks, Weed Cutters, Weed Scythes, Weed Cultivators, Weed Diggers, Weed Trimmers, Weed Grubbers, Weed Gloves and other tools and accessories including Organic Weed Herbicides and Weed Barriers and special Ergonomic Tools for people with arthritis or CTS.